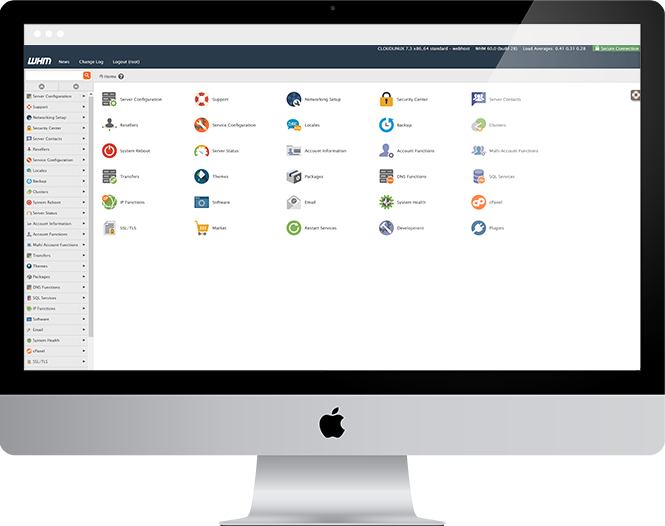 cPanel & WHM is the world’s premier cloud hosting automation software. Features within the product include: website management, email management, domain management, and enhanced security. cPanel & WHM provides the website owners, reseller's and server administrators all the tools necessary to take their product to the next level. cPanel features allow you to manage your domains. You can park, add-on, create sub-domains, redirect domains as well as use the advanced DNS editor. If you have been struggling with your domain management due to using a variety of domains then this is your control panel. As a hosting reseller, you design your own hosting packages from the resources we allocate to your account. Each account you create is separate from your own accounts, ideal for creating hosting packages for your clients. We run special high-power reseller servers: Supermicro with dual E5 CPUs, 32GB+ RAM and RAID 10 SSD hard drives. Our Networks run on Juniper/Cisco products, they deliver fast, reliable, secure hosting like never before. Below you will find our cloud hosting feature list, to insure your requirements are met. If you are a novice in web mastering it may seem a bit complicated. But don’t get confused because most likely we support all the cloud hosting features you’ll need to build and manage your site. Having doubts? Don’t hesitate to contact our support or sales staff and ask all your questions and concerns we’ll walk you through and help you find the best and affordable cloud hosting solution for your particular needs.